3. Click on the Change GSA Settings button and fine-tune the output according to your preferences. 3.4. 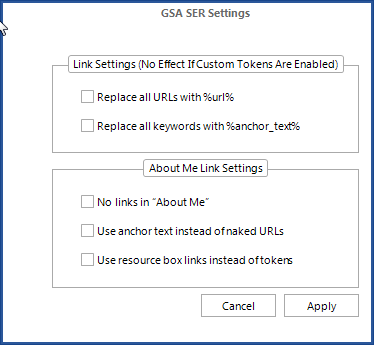 Use anchor text instead of naked URLs - By default KM will place naked URLs in the GSA "About Me" sections. If you check this option, it will use the above tokens to construct the anchor text. 3.5. Use resource box links instead of tokens - KM will use whatever URLs/keywords you have defined as Resource Box Links instead of the default tokens.